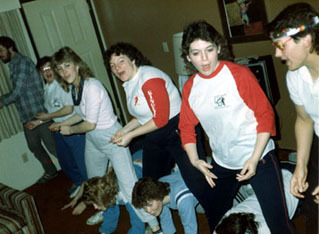 The fifth annual Booster Club Ringette School was held August 1-6, 1983 at Village Square Leisure Centre. Instructors included: Linda Tippin (Head Instructor), Geri Zuk, Beth Little, Michele Travis, Laura Webb, Sue Rogers, Carmen Bell, Terry Crouse, Cheryl Govenlock, Sue Chudleigh, Lyndsay Wheelans, Barb Conway, Laurie Moore and Jackie Willis. 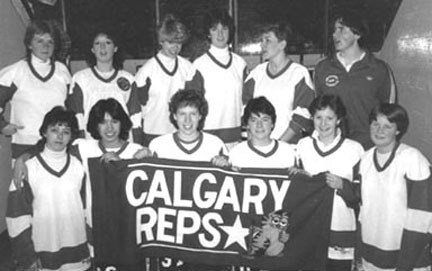 The Calgary Ringette Referees Association was formed early in the season, with intentions of upgrading the quality of officiating in Calgary. Junior Belle players were given the choice of playing EITHER houseleague or rep (A). This created the first Junior Belle Rep Team which was not "double carded". The Rep Teams participated in a inter-city league between Lacombe, Edmonton and Sherwood Park. 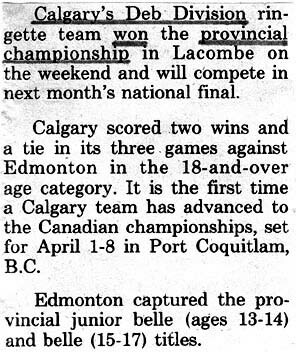 In the 1983-84 Houseleague Tournament (Feb 3-5), there were 12 Petite teams, 14 Tween teams, 10 Junior Belle teams, and 6 Belle teams. The Calgary "A" level tournament (Feb 24-26) hosted 4 Junior Belle, 8 Belle and 3 Deb teams. Both tournaments were run by Mike Tait, with assistance from Bill Allen, Orvil Anderson, Yvonne Armstrong, Jim Beattie, Frank McNabb, Jean Moore, Arlene Redmond, Joe Smith and Laura Webb. There were 442 players registered (41 teams). 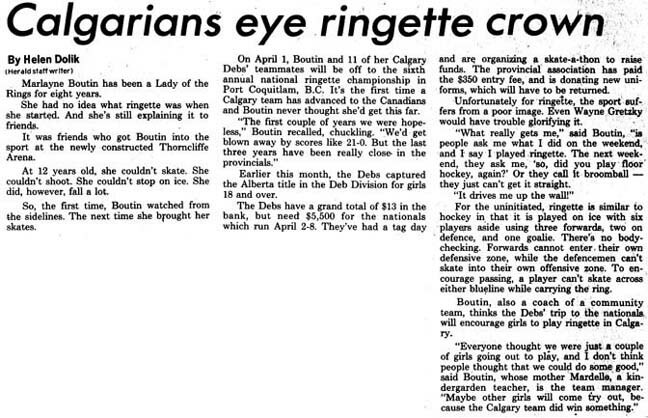 National Ringette Week was held from February 5-12, 1984 - there was a ringette demo at the Calgary Wranglers Game (feb 8) to promote national ringette week. There were two editions published of the RINGETTE GAZETTE - a Ringette Calgary Newsletter. Editors were Beth Veale and Laura Webb. Linda Tippin and Frances Willis started a beginner program for Bunny aged players. Frances Willis became the first Calgarian to serve on the RINGETTE CANADA Executive, holding the position of Treasurer. A Mandatory Coaches/Team Registration meeting was held. 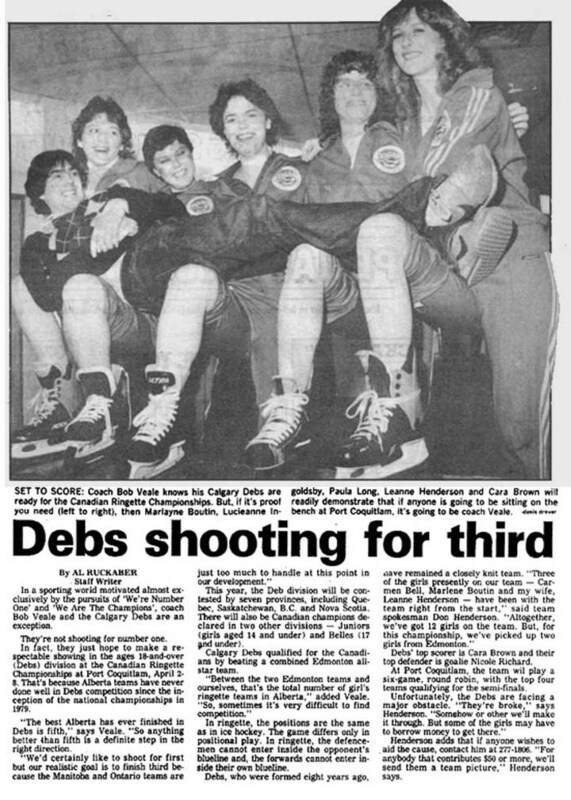 The Calgary Deb Rep Team won Provincials and attended the Canadian Ringette Championships in Port Coquitlam, BC where they finished 6th. Front Row: Kim Cramm, Beth Little (Veale), Marlayne Boutin (Brandsgard), Cara Brown, Brenda Barth.